The parents, baptismal godparents, friends and any other people invited don’t attend the First Communion ceremony empty-handed. While choosing an appropriate gift for a First Communion we must observe, that a First Communion is a holy event, so we must choose a gift of religious nature. In the post Are You familiar with Catholic First Communion Symbols you can read about the symbols, that indicate the importance of the Holy Eucharist. Host, bread, grain, wine, grapevines, grapes, and chalice are the most known motives and symbols of the First Communion. An appropriate gift for a First Communion must, besides being useful and aesthetic, also express its symbolic value. To choose the right gift we must know the symbols which are connected to this sacrament. Knowing them will make it easier for you to choose the right gift. While choosing the gift we must also consider the age of the children, who might love modern designs. The child won’t be too happy if he/she receives a Cross or a holy picture that is similar or the same as the one, that has been sitting in his grandparents’ room for years and years. He/She probably also doesn’t really want a Rosary, that he/she sees held in his grandmother’s hands every day. The rosary is one of the most powerful sacramentals of the Catholic Church. First Communion Rosary is an appropriate gift for First Communicant. It introduces him/her to the word of praying with a rosary and the spiritual life. By reading and browsing through the Holy Bible, the child will learn about faith and God. The Holy Bible should be appropriate for the child’s age. You can choose a full Bible or a picture Bible. Cross is the most significant symbol of Christianity. Wall Crucifix / Cross, hanging on the wall will remind the child of the time when he/she first accepted Jesus. Standing Cross/Crucifix are daily reminders of First Communicant’s faith and make great decorations for desks, tables, and shelves. Religious Jewelry is also an appropriate gift for a First Communion. Especially rosary bracelet, cross necklace, a patron saint medal or Four-Way Medals in special First Communion designs are really popular. 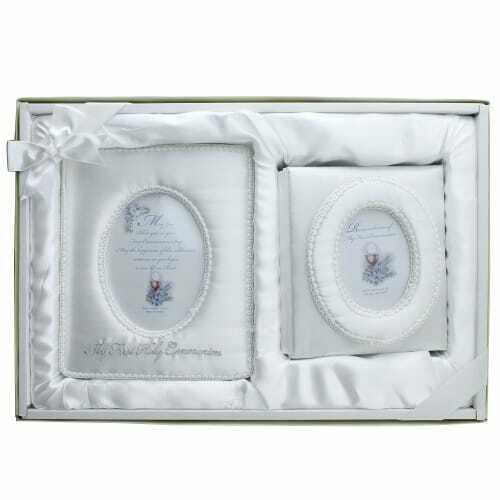 Picture frame and photo album that shows and stores the most beautiful moments of the First Communion celebration. You can personalize the frame or the album with the child’s name and the date of this special day. 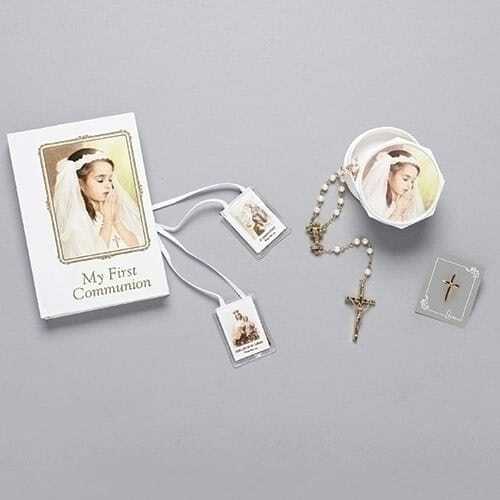 The Catholic Company store online offers and recommends First Communion gift set as a most appropriate gift for First Communicant. 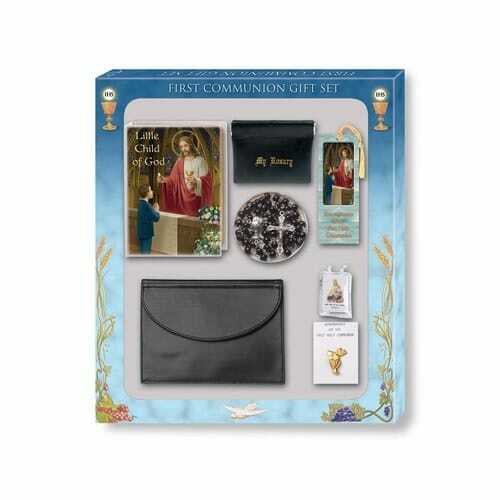 First Communion gift sets include a wide selection of traditional First Communion gifts. 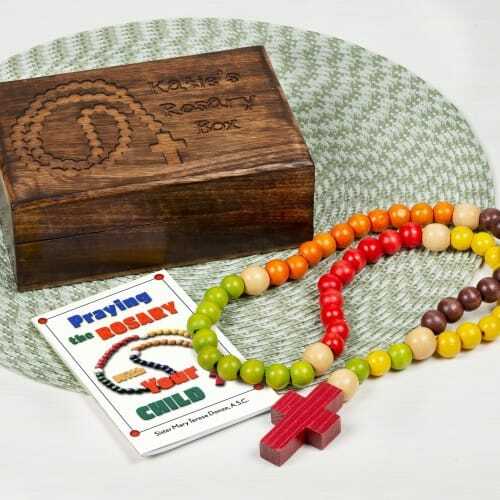 Other gifts include rosaries, crosses, jewelry, prayer books, and Bibles. My overall review of The Catholic Company can read on this link. 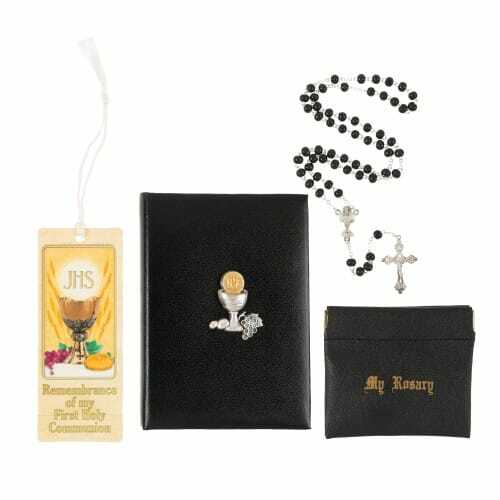 Aquinas and More Catholic Goods store online has a variety of First Communion gifts including special First Communion cards, rosaries, jewelry with Eucharistic symbols, First Communion gift sets that include rosaries, scapulars, children’s missals and monstrance pins and First Communion banner kits. 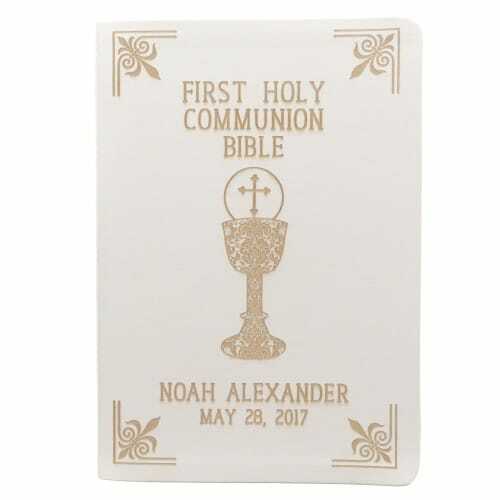 Very popular are First Communion Bibles, that can be imprinted with the child’s name. They also carry a wide selection of crosses and photo frames. Here you have my review and information about Aquinas and More store online. Ignatius Press is considered one of the premier religious book publishers in the world. On the website www.ignatius.com, you can buy a various type of Bible and other Catholic books. Besides the Bible and Catholic books, they offer religious art products like statues of Jesus, Mary, angels and Saints, pictures/icons, crosses/crucifixes. 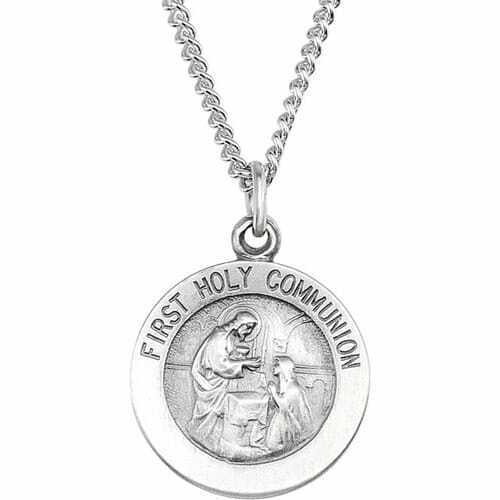 In addition, on the site, you can find other First Communion gift ideas (jewelry, rosaries, medals). Christian Catholic Shop is a parishioner owned and operated Catholic store online. 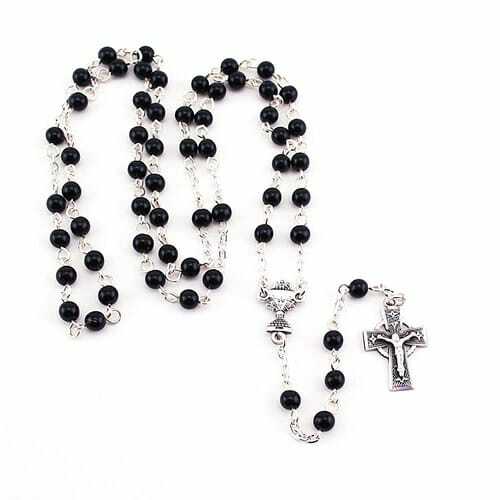 They offer different Catholic product from apparel and accessories, rosaries, jewelry, and other gifts and decor religious items for any occasion. You should visit this web store when you are searching for first communion, gift. My review of Christian Catholic shop website can see here. Do you have any other ideas about what Is an Appropriate Gift For a First Communion? Share it with us in the comments below. Prev Are You Familiar With Catholic First Communion Symbols? I’m sure glad I came across your website. My wife and I were just discussing what kind of gift to give our nephew. He is getting ready to receive his first communion Friday. My wife just read your article as well. I’ll leave the final decision to her. Thanks for the great tips! Thank you for taking the time. I am glad you found the article useful. God bless your family and especially your nephew/First Communicant. The appropriate gift for a first communion following the Christian tradition are not the ones that we used to give to a child! The advice given on this site is important because the gift has to suit the celebration of the communion! Communion means to unite with the Christ! This can not be achieved by a present like a play-station! The advices in this site are good because the gift has to have also a symbolic value! It was a pleasure to comment your site. Thank you, Attila for visiting my site. We both understand the real meaning of First Communion. It is above all the religious events and, as you wrote, means to unit with the our Savior Jesus Christ.